This post is inspired by the excellent book by Robert Banks – Towing Icebergs. This book would make a great investment if you want some novel ideas for a maths investigation. Galileo Galilei was an Italian mathematician and astronomer who (reputedly) conducted experiments from the top of the Tower of Pisa. He dropped various objects from in order to measure how long it took for them to reach the bottom, coming to the remarkable conclusion that the objects’ weight did not affect the speed at which it fell. But does that really mean that a feather and a cannonball would fall at the same speed? Well, yes – as long as they were dropped in a vacuum. Let’s have a look at how we can prove that. The LHS of our equation (psgV – pagV – FD) represents the forces acting on the object and the RHS (psVa) represents mass x acceleration. Therefore the velocity (U) of the falling object in a vacuum is only dependent on time and the gravitational force. In other words it is independent of the object’s mass. Amazing! This might be difficult to believe – as it is quite unintuitive. So if you’re not convinced you can watch the video below in which Brian Cox tests this out in the world’s largest vacuum chamber. War maths – how modeling projectiles plays an essential part in waging wars. I believe this was also demonstrated on the Moon by one of the later Apollo missions where the astronaut dropped a hammer and a feather. Very nice – love the simplicity of the derivation but the power in the final result. Thanks for posting. Thanks for the comments – I have added the video about the moon experiment. Yes, I was quite surprised that it was so simple to show! I might try and look at some other basic Newtonian laws and what we can derive from them. Next up, parachute jumps! See also the (to me) far more significant thought exp. 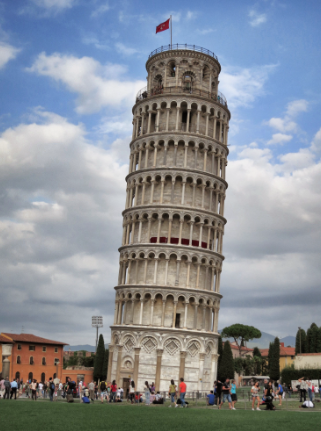 of Galileo referenced at https://en.m.wikipedia.org/wiki/Galileo%27s_Leaning_Tower_of_Pisa_experiment. “Galileo arrived at his hypothesis by a famous thought experiment outlined in his book On Motion. Imagine two objects, one light and one heavier than the other one, are connected to each other by a string. Drop this system of objects from the top of a tower. If we assume heavier objects do indeed fall faster than lighter ones (and conversely, lighter objects fall slower), the string will soon pull taut as the lighter object retards the fall of the heavier object. But the system considered as a whole is heavier than the heavy object alone, and therefore should fall faster. This contradiction leads one to conclude the assumption is false.”. For further clarity, the reader might imagine a large ball and a small ball made out of the same material, connected by a wire made out of the same material. Now let the connecting wire get thinner and thinner. At what point does the velocity of falling decrease because one object becomes two? « Thailand Maths Challenge Launched!